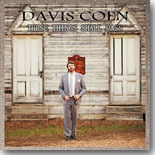 Country blues artist Davis Coen heads to the riverside for a very nice collection of gospel tunes for his latest album, These Things Shall Pass. It's this month's Pick Hit. Pacific northwest singer Karen Lovely checks in with our Surprise CD of the month, the independent Fish Outta Water. Our Flashback album of the month takes a look at some excellent 1993 Chicago recordings, Turn My Life Around, from underappreciated harmonica ace Big Golden Wheeler. Our What's New section features new CDs from Mick Kolassa & Mark Telesca, Vintage #18, John Primer & Bob Corritore, Corey Dennison, Laura Tate, Monster Mike Welch & Mike Ledbetter, Bridget Kelly Band, Dirty Mojo Blues Band, Low Society, Bobby Messano, Andy T Band, and more.